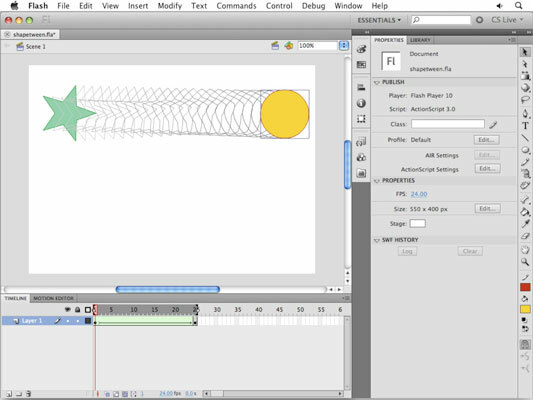 Adobe Flash Creative Suite 5 can open up new worlds for creating quick, sleek animation without much effort. You should take advantage of shape tweens if your goal is to modify the shape of an object from start to finish, such as morphing a star into a circle. For the most part, shape tweens are created in quite a similar manner to motion tweens. However, unlike motion tweens, shape tweens must use raw shapes instead of symbols. In addition to morphing between distinctively different shapes, shape tweens can morph color. As with motion tweens, you can tween only one shape at a time on a single layer. If you want to create multiple shape tweens simultaneously, isolate each one on its own layer. Create a new Flash document. At the bottom of the workspace, click the Timeline panel’s tab to bring it forward. On an empty layer, draw a shape (for example, a star or polygon with the Polystar tool) on Frame 1. You can include a stroke and a fill, because the shape tween can handle both. Click on Frame 25 and choose Insert→Timeline→Blank Keyframe. Rather than choose the motion tween, we choose a blank keyframe because we don’t want a copy of the shape drawn on Frame 1 to be carried over to the new keyframe. Draw a distinctively different shape on the new, blank keyframe on Frame 25. Select Frame 1 and choose Insert→Shape Tween. You see an arrow and a green shaded area appear between the starting and ending keyframes, indicating that you’ve successfully created a shape tween. Turn on the Onion Skin Outlines option below the Timeline to see the frames that Flash has created for you. If necessary, use the sliders that appear on the timeline ruler to show Onion Skin Outlines across the entire range of frames from beginning to end. Press Enter or Return to play back your animation. The original shape transforms into the final shape. Try using these steps to create a tween between two type characters. Create the letters using the Text tool. Break the characters into their raw forms before creating a shape tween by choosing Modify→Break Apart.